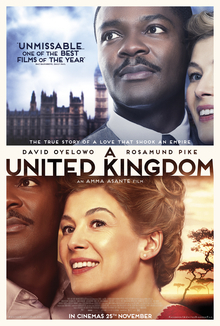 ‘A United Kingdom’ is a thoroughly entertaining romantic drama based on the true story of an African prince who married a white woman, and how they overcame the disapproval of both their families as well as the British and South African governments to make it a success. It’s a true ‘love conquers all’ kind of story but it’s depicted in a remarkably grounded way and I was drawn in from the outset. The trailer is perhaps a little overwrought with its grand statements of ‘the love that brought down an empire’, but don’t let that put you off. This is an intelligent film that successfully blends the love story at its core with the political backdrop and Amma Asante’s direction and Guy Hibbert’s writing manage to keep both elements interesting. A few weeks ago whilst listening to Mark Kermode and Simon Mayo’s BBC film podcast, it was stated about this film that it makes ‘the personal political, and the political personal’, and I couldn’t put it in any better terms myself. Amma Asante is no stranger to tackling untold stories from British history following on from her breakthrough film ‘Belle’, and ‘A United Kingdom’ shares many similarities with that film. She’s particularly aided by a sterling cast, led by the imperious David Oyelowo as Prince Seretse Khame, and Rosamund Pike as Ruth Williams, his future wife. Oyelowo was so impressive as Martin Luther King in ‘Selma’ and he’s incredible once again as a lesser known historical figure, excelling in particular during the moments when he has to give a speech. These are amongst the most powerful and rousing moments in the film but ‘A United Kingdom’ is equally impressive in the quieter moments when it focuses on the early stages of Ruth and Seretse’s courtship or in portraying the anguish as the couple are kept apart against their will. The pick of the support is Jack Davenport who plays a really superb prick, one of the government officials who is determined to make life difficult for the couple, whilst there are solid cameos from Jack Lowden and Anton Lesser as real life politicians from the time period. At this time of year, many biopics will come out with awards attention in mind, some of which will be worthy and some of which won’t. ‘A United Kingdom’ falls into the worthy category and this is a strongly crafted and superbly performed drama that I was really taken by.